Bill Smith is remembered as his best teacher at Hillsboro High School. "In ninth grade, Mr. Smith put us all into teams and had us each safely master the metal shop processes. He then expected us to fabricate something we had designed from scratch. Many of us made one-of-a-kind motorized farm machinery using parts from behind the barn or from 'Junk Wiebe's" community srap yard. There were no impossible ideas in Mr. Smith's class." Bartel maintains his own ceramics studio in Goshen, Indiana. 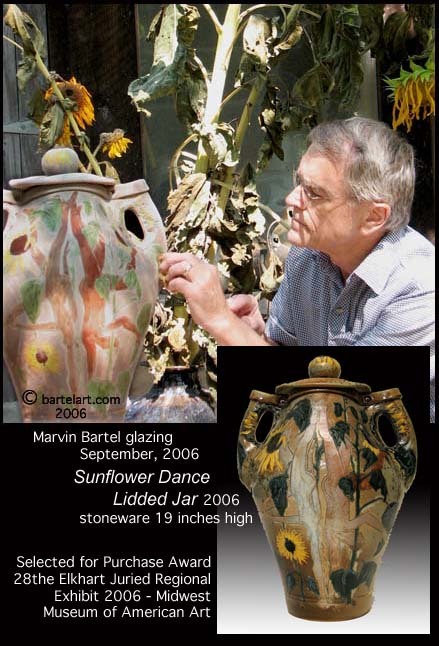 Bartel’s work has been shown in many national, international and regional exhibitions including the 24th and 25th Ceramic Nationals, Everson Museum of Art, Syracuse, New York; American Jewelry Today, Scranton, Pennsylvania; Craftsmen of the Central States, Museum of Contemporary Crafts, New York; 9th Annual Own Your Own Exhibition, Denver Art Museum; 18th Annual Decorative Arts and Ceramics Exhibition, Wichita, Kansas; Cerritos Ceramic Annual, Cerritos, California, National Cone Box Show, Kansas University, Lawrence, Kansas; National Cone Box Show, Purdue University, West Lafayette, Indiana; and Ceramics International, Edmonton, Alberta, Canada. Bartel's work is a regularly selected for the Annual Elkhart Juried Regional Exhibitions, Midwest Museum of American Art, Elkhart, Indiana. He won best in ceramics awards in 1992 and 1995. Bartel authored "A Revolutionary New Kiln" published in Ceramics Monthly in September, 1990. This describes his research and invention of US Patent #4,139,340, Kiln Heat Exchanger. Bartel's kilns significantly reduce fuel usage by using the waste fuel gases to preheat the combustion air up to 2000 F before it is mixed with the fuel. Since retiring from teaching full-time, Bartel has conducted sessions on creativity, assessment, and/or other teaching topics with teachers in Michigan, Missouri, Nebraska, Colorado, New Jersey, Indiana, Illinois, Wisconsin, Washington, Washington D.C., and at a bilingual school in Brazil, South America. He has done design work for a nature center and developed questions and strategies used to motivate creativity with self-instructional art kits. He and Delores enjoy a small orchard and garden. They are participants at the Eighth Street Mennonite Church, Goshen, Indiana. Their family includes 3 married children (two scientists and a writer). They have six grandchildren. Dr. Bartel is available as a consultant in art education, building design, and kiln design. He also fills orders for clay tile murals, sink basins, sculpture and other art projects. consultation in art education. kiln design, and so on. ways to help children learn art, drawing, and pottery. All Rights Reserved. © 1998, 2008, 2012 Marvin Bartel. requires permission from the artist. Marvin Bartel - Emeritus Professor of Art, Goshen College. Bartel was a member of the art faculty at Goshen College from 1970 through 2002. He taught courses in art education, ceramics, photography, drafting and architectural design. Dr. Bartel continues as a consultant, lecturer, workshop and seminar leader in art education and in creativity education. His essays are posted at his Art Education website. He continues to be an active artist, writer, and traveler. Prior to coming to Goshen he was tenured at Northeast Missouri State University (now Truman University) where he brought ceramics to their art department (1965 to 1970). Earlier he taught drawing, painting, and design at Bethel College (Kansas) and headed the creative arts at Prairie View Mental Health Center, Newton, Kansas. Bartel began his career at Topeka High School (Kansas) in 1960 teaching ceramics, jewelry, and other art courses. Dr. Bartel has master's and doctor's degrees in art education from the University of Kansas. He majored in art at Bethel College (Kansas), also studying art at Washburn University and Wichita State University. His pre-college years were spent attending public schools, doing chores, daydreaming, drawing, and tinkering on a family farm in Kansas. downloaded as a .pdf file.